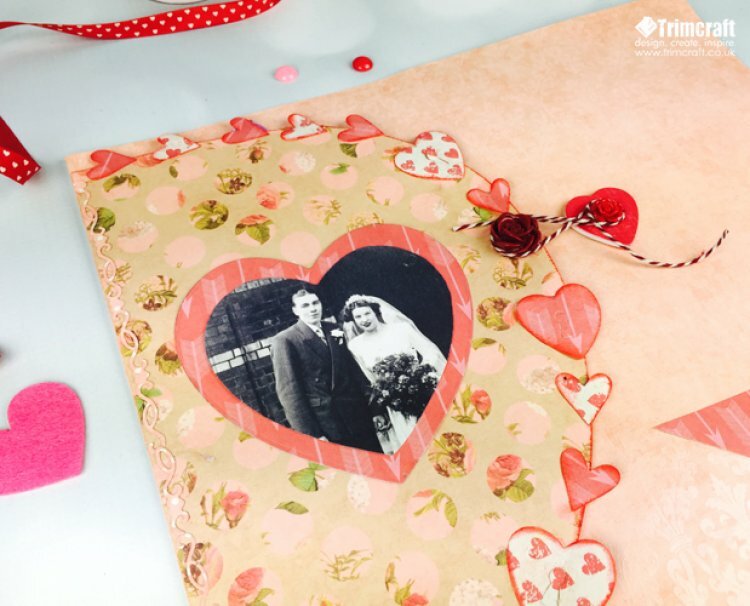 Create the perfect personalised love story Scrapbook for that special someone this Valentines, with this easy to follow tutorial. Everyone loves a thoughtful gift and with this design, you can add memories of your time together and a personal message in the pocket inside. 1) Using the 12x12 Love Story paper pad, take a sheet of paper and draw half a heart down the page and cut it out. 2) Using a ruler, measure 1cm in from the straight edge of the heart and score a line with a pair of scissors and fold to create a flap. 3) Use double sided tape to secure the flap to the left edge of another Love Story 12x12 sheet. 4) Cut out a smaller heart shape from the 12x12 Love Story paper pad, large enough for a photo, and using a glue stick, position the paper heart and adhere to the centre of the heart flap. 5) Mat your photo onto the patterned heart shape. 6) Using the buckles set, cut out a few borders and decorate the left edge of the heart flap. 7) Cut out a mixture of hearts using the Willow die set and decorate with red inked edges , glue along the curved side of the heart flap. 8) Glue a resin flower to the centre of the heart flap to begin making a clasp. On the right of this resin flower, stick a wooden button heart on the square card. Add another resin flower on top of this to give the card dimension. Tie together with a small piece of twine to connect the half heart shape and card. 9) Open up the flap and cut a piece of card about 7x4 cm to make a pocket. Cut out more decorative toppers from the Love Story pad and layer on to the pocket to add a scrapbook effect. Glue the left, right and bottom edge of the pocket and ensure to leave the top edge un-glued. 10) Cut out a tag from the 12x12 Love Story pad and write a message on the back, insert into the pocket before closing the flap. 11) Cut a strip of paper 15.5x6cm and on one end, cut a fishtale, align the straight edge to the bottom left corner of the page and using a glue stick, adhere the paper onto the card. Cut out a few more of the tags from the 12x12 sheet and layer them together to gain the collage effect. 12) Finish the page by cutting out a title using the varsity die set on craft foam. Use craft glue to stick the title to the layered tags. Scrapbooking is a great excuse to compile your favourite memories for special occasions, why not use the same design for a birthday, graduation or wedding? Remember to upload your wonderful makes to our project gallery!